You are currently browsing articles tagged Borg. When I was a boy skating on Brooks Pond, there were almost no grown-ups around. Once or twice a year, on a weekend day or a holiday, some parents might come by, with a thermos of hot cocoa. Maybe they would build a fire — which we were forbidden to do — and we would gather round. But for the most part the pond was the domain of children. In the absence of adults, we made and enforced our own rules. We had hardly any gear – just some borrowed hockey gloves, some hand-me-down skates, maybe an elbow pad or two – so we played a clean form of hockey, with no high-sticking, no punching, and almost no checking. A single fight could ruin the whole afternoon. Indeed, as I remember it 30 years later, it was the purest form of hockey I ever saw – until I got to see the Russian national team play the game. But before we could play, we had to check the ice. We became serious junior meteorologists, true connoisseurs of cold. We learned that the best weather for pond skating is plain, clear cold, with starry nights and no snow. (Snow not only mucks up the skating surface but also insulates the ice from the colder air above.) And we learned that moving water, even the gently flowing Mystic River, is a lot less likely to freeze than standing water. So we skated only on the pond. We learned all the weird whooping and cracking sounds that ice makes as it expands and contracts, and thus when to leave the ice. Do kids learn these things today? I don’t know. How would they? We don’t even let them. Instead, we post signs. Ruled by lawyers, cities and towns everywhere try to eliminate their legal liability. But try as they might, they cannot eliminate the underlying risk. Liability is a social construct; risk is a natural fact. When it is cold enough, ponds freeze. No sign or fence or ordinance can change that. In fact, by focusing on liability and not teaching our kids how to take risks, we are making their world more dangerous. When we were children, we had to learn to evaluate risks and handle them on our own. We had to learn, quite literally, to test the waters. As a result, we grew up to be more savvy about ice and ponds than any kid could be who has skated only under adult supervision on a rink. While Chris lived in Medford, near Boston, I lived Maywood, New Jersey, which is near New York. Like Medford, Maywood was a mixed blue/white collar town. Still, it wasn’t dangerous.. Nobody worried about a kid being ‘napped. Or abused, except by bullies (which were normal hazards of life). Kids were taught early to be independent. I remember how I learned to walk to kindergarten. Mom came all the way with me on the first day. On the second, she let me walk the last block myself. Then one block less the next day. Then one block less the next day. Finally, I walked all the way myself — about half a mile. I had turned five years old only two months before. We mostly skated at Borg’s pond, in Borg’s Woods, a private paradise under a canopy of old growth hardwood on the Maywood-Hackensack border, owned by the Borg family, which published the Bergen Record during its heyday as a truly great newspaper. The pond is still there, inside the green patch at the center of this map. 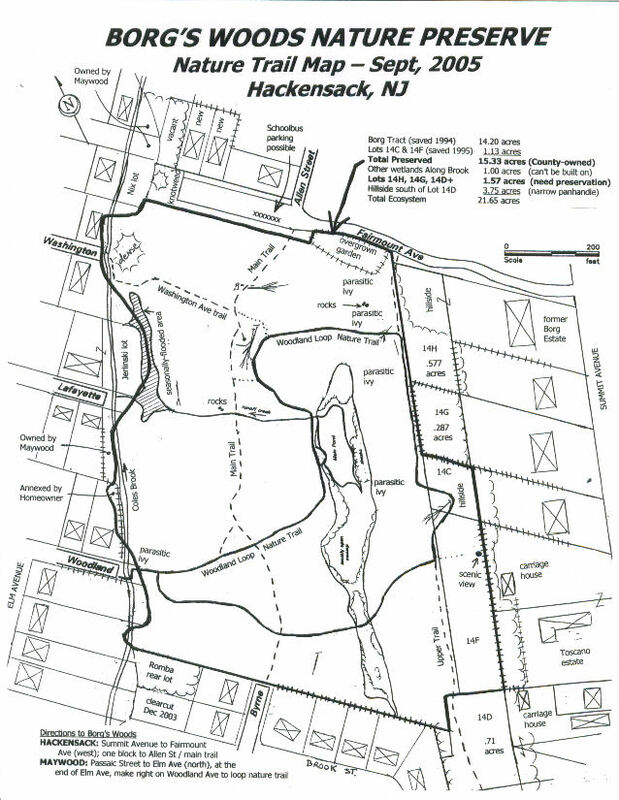 Great to see from the Borg’s Woods Page (actually a site with much more) that the woods is now a preserve Here’s a trail map that shows the pond. 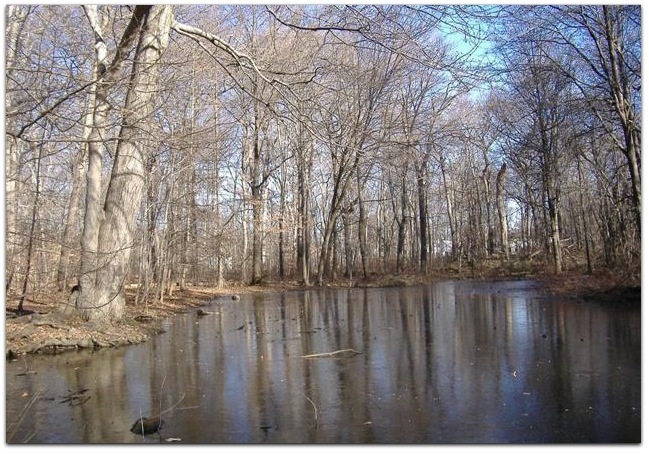 And here is a tour of the woods that shows the pond (I hope Eric Martindale, who maintains the site, doesn’t mind my borrowing the pond shot above), the “four oaks” that are still standing (and where we used to have club meetings), the sledding hill behind the Borg house and more. What a treat to find that it hardly looks any different now than it did fifty years ago. We could skate on larger water bodies too. There were other lakes and reservoirs nearby. I also have fond memories of Greenwood Lake , where I lived a young adult, editing the late West Milford Argus. Ours was a former summer house (made mostly of cast-off parts) only a few feet from the shore. In the winter we skated there and in the summer we canoed up into New York (State), across the border of which the long lake lay on maps like a big stitch. Anyway, Chris is right. On the whole we were more free. Not of restrictions. Parents were much more stern and disciplinary back then. Spanking, for example, was pro forma. Our freedom was from fear of what might happen as we became more independent and self-reliant. Thinking more about it, I don’t want to idealize my childhood years. We lived in constant fear of nuclear annihilation, for example. Through much of my childhood I kept a list in my head of all the places I wanted to see before everybody was incinerated by some politician with an itchy finger. There were also racial, sexual and other forms of oppression, repression and worse. But we were a bit closer to a natural state in some ways, I think. Or at least kids were. Outside of school, anyway. By the way, I see that the Brooks Estate, home of Brooks Pond, is now also a nature preserve. As it happens I have also shot pictures of that place from the air. Here’s one. And here’s a shot of Spy Pond (subject of my last post).